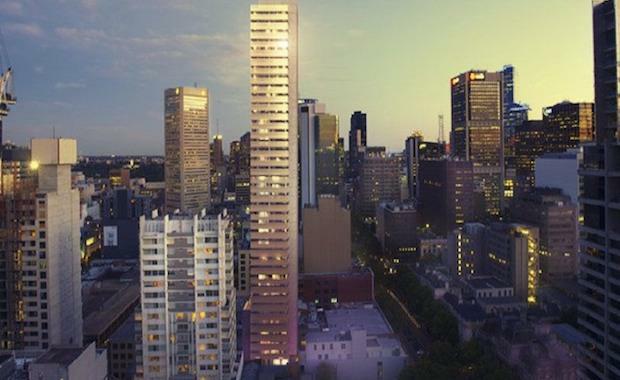 An existing development site at 399 Little Lonsdale Street has resurfaced, seeking approval for a revised planning scheme that would inject a new 199 metre tower into central Melbourne. 399 Little Lonsdale Street represents the second large-scale project designed by K2LD Architects following the recent planning submission for 1-5 Queens Street, also in Melbourne CBD. Increase in floor to ceiling heights to improve amenity of rooms and apartments. The proposed 199 metre tower will complement the adjoining property at 272 Queens Street which currently holds planning approval for a 210 metre mixed-use tower. With the increased height of the building being the most notable change, 399 Little Lonsdale Street will also receive a new external appearance, comprising of angulate façade panels which disrupts the smooth external finish. This random angulation over certain panels will cast differing shadows over the façade providing the tower with a dynamic aspect. The above ground car park allotment has been relocated to a basement facility while the previous podium level car park will be occupied by the hotel suites and apartments. Clement Lee's Riverside Properties Pty Ltd may seek construction for 399 Little Lonsdale Street soon after approval. Considering the relatively low number of apartments located within the revised 399 Little Lonsdale scheme and the possibility that another Pegasus Apart'Hotel may account for one of the two hotel sections, the revised design could in theory gain the necessary pre-commitments to proceed to construction shortly after approval.